On a whim we recently enjoyed a grown ups only dinner at the newly opened Five Points Tavern. I suppose with the word “tavern” in the name, and the fact that it occupies the former O’Brothers space, I was expecting something like a pub. Five Points Tavern is not much of a pub at all. Which stands to reason since high end “taverns” have been a trend in the industry over the last several years. The space at Five Points Tavern is clean and minimal, with wood tables and white walls.The menu is printed on a single page, though not lacking variety or quantity of choices. There are a few tables near the front of the restaurant, and just over a dozen tables in a cozy room beyond the kitchen. We started our meal with an order of bread and butter (olive oil drizzled and grilled, $3), Octopus (melted leek, romesco, olive, $13), and a Margaret Street cocktail (Hendricks, cucumber, ginger, prosecco, $12). The bread was good, though it was maybe a little heavy with both olive oil and butter. Plus it was slightly irritating to have to order and pay for bread and butter. If it hadn’t been offered at all it would have been a non-issue, but to see it on the menu as an appetizer just cheapened the feel of the restaurant. Charging for bread seems to be a trend in the industry and it’s a decidedly bad one. The octopus, on the other hand, may very well be the best octopus in Jax. It was without a doubt the most tender octopus we’ve had anywhere, and we order octopus from any menu daring enough to offer it. The romesco sauce was bursting with flavor and added tremendous depth to the dish. If you were ever going to try octopus, Five Points Tavern is the place to do it. Although, you’ll be ruined for eating octopus anywhere else. The cocktail was a delight, and as a lover of gin, fresh cocktails, and champagne it was nearly calling my name out loud. 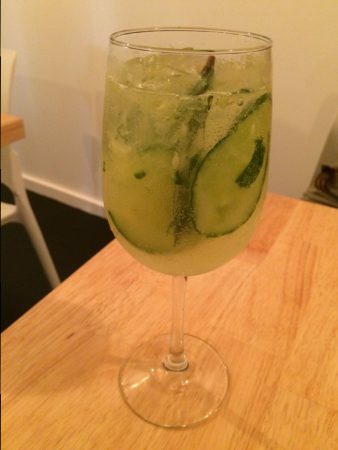 There is a 100% chance I will have this cocktail again. Following our bread and butter we divided and conquered the soups. Tomato-Bacon Bisque ($7) is offered daily, and Oyster Corn Chowder was the daily selection ($7). The Tomato-Bacon Bisque was flavorful, with plenty of tang from the tomatoes and tons of smoke from the bacon. It was on the intense side, so if that’s not what you’re into you should probably skip it. We enjoyed sharing it, but did not finish it. The flavor was nearly cumulative, seemingly getting stronger as we ate it. The Oyster Corn Chowder was excellent. It was similar to a clam chowder with oysters instead but slightly heavier/richer in the best kind of way. There was one large oyster in our bowl of soup, along with an incredibly flavorful cream based soup. If you enjoy a seafood chowder, you will love this soup. For our entrees we went with the Endive Salad (endive, gorgonzola, walnut, tomato, $14), Mussels (white wine, butter, garlic, thyme, $11), Orchiette pasta (orchiette, sausage, garlic, broccoli rabe, $16), and a side of Pan Corn ($4). The endive salad was unlike anything else I’ve had and pretty fantastic. 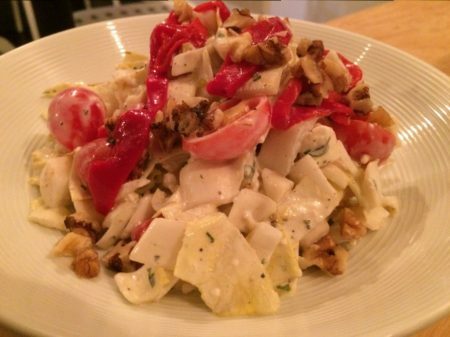 It was chopped endive, walnut, tomato, and gorgonzola mixed in a thick gorgonzola dressing. It nearly had the effect of eating a chicken salad, with the chunks of endive and the dressing dense and flavorful, tossed throughout the salad. This salad was far from what we were expecting in the best kind of way. It was a bit rich, making it difficult to eat more than about half of it. 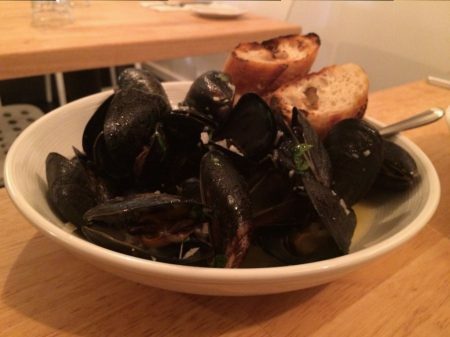 The mussels were a solid, straightforward choice. 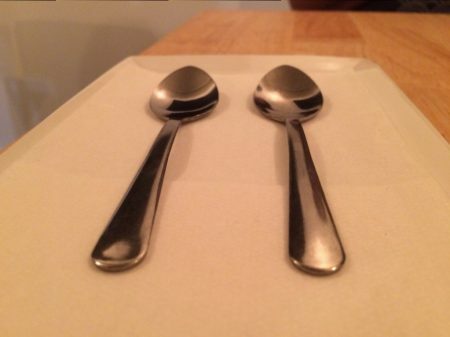 The serving size is a good value and the dish itself was enjoyable. The orchiette pasta was not our favorite, but we were glad to have tried it. Orchiette is a round, concave pasta. It reminded us of those little toy suction cups we used to get with arcade tickets, the little half spheres you would press on a flat surface and then wait to watch them pop up in the air. That’s more or less what orchiette pasta looks like. Unfortunately they tend to stick together, so al dente for a single orchiette means extra chewy when two or three stick together, which they like to do. If you like really firm pasta you’ll be a fan. We learned that we don’t love really firm pasta. 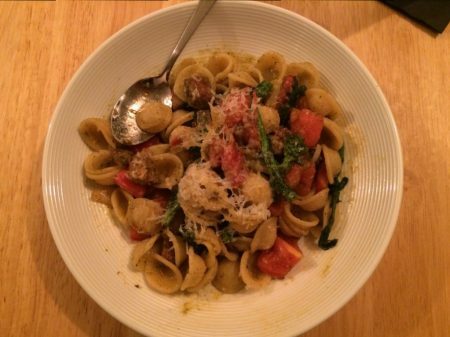 Note that broccoli rabe is a more acquired taste than your average green veggie, so keep that in mind also when ordering this dish. The pan corn is just pan roasted corn, but it was super delicious. The a la carte side dish was a generous, sharable size. For dessert we decided on the salted chocolate mousse with dark caramel. Woah. Did this dessert fall from heaven? Because it tasted like it was made by an angel. It was served in a brandy glass and had freshly shaved chocolate sprinkled the top. I can vouch for it because I watched someone in the kitchen pull out a microplane and grate a chunk of chocolate over the dessert right before it was delivered to our table. HEAVEN. The mousse was velvety with just a touch of salt and a deep chocolate flavor. 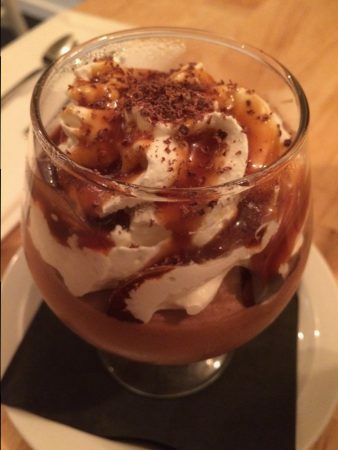 The dark caramel was rich and smooth and sticky, with whipped cream on top, rounding out the textures and flavors. This dessert is too good to share, but too big to eat alone. 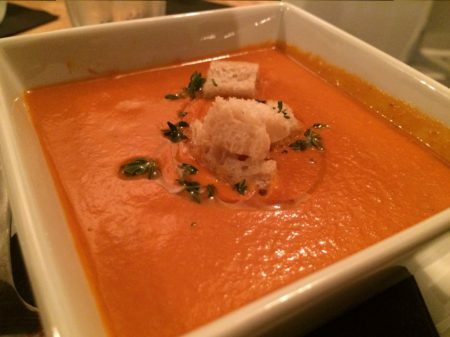 We recommend sharing it with someone special. We went into Five Points Tavern with no set expectations, but our dinner and the service blew us away. Our waitress explained the menu, answered all of our questions, and consulted the chef for our more detailed questions about ingredients and preparation. Both the kitchen and our waitress kept our many dishes coming out in a timely progression, and we never had to ask for anything we needed. It was always arriving or already there before we could ask. Five Points Tavern is a great spot for date night or a night out with friends. The great service and fresh and delicious food will keep you contentedly in your seat, enjoying the company of the ones dining with you. Tagged Alcohol Serving, american, French, Full Bar, New American, romantic, Serves Alcohol, tavern. Bookmark the permalink.